I’ve been a fan of the movie adaptation Fried Green Tomatoes for a great many years. I also enjoyed Fannie Flagg on countless episodes of The Match Game thanks to reruns on The Game Show Network, so it was with great joy and even greater anticipation that I picked up the original novel. I needn’t have been nervous. 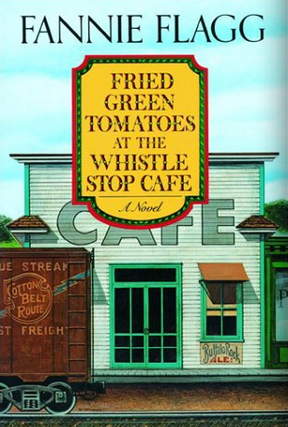 Picking up Fried Green Tomatoes at the Whistle Stop Cafe is like getting lost in a fascinating conversation with an old friend who excels at telling stories. The pages fly by effortlessly until you realize with a pang of disappointment that you’re nearing the end and the story is going to have to stop soon. I can think of no greater compliment than that. There are two primary stories being told here. First we have Evelyn Couch, a woman stunned to find herself middle-aged and deeply unhappy with the life she has lived–or rather, the way she has avoided living life up to this point. Visiting her mother-in-law at a nursing home, Evelyn comes across Ninny Threadgoode, whose verve and life force make Evelyn come alive as Ninny tells her stories of her home town of Whistle Stop–and mostly about the other primary characters, Ruth and Idgie. Ruth and Idgie owned the Whistle Stop Cafe, which was the heart of the town and a frequent source of controversy. Not to mention possibly a murder. There are, of course, many other character and stories balancing things out, but theirs are told within the framework of these four women: Idgie and Ruth, Evelyn and Ninny. Flagg’s affection for her characters is palpable, and the way both they and the town of Whistle Stop come to vibrant life is breathtaking. As the story progresses and time ravages on, Flagg gets in poignant truths about life, friendship, and family, but also about how the present all too quickly becomes the past. That she manages to make these truths both on the personal level and the larger levels of society shows a surprising amount of depth and gravitas one might not have expected–and that one could almost be forgiven for not noticing given how effortlessly Flagg manages to weave everything together.